Toronto A clash of classes: The other side of Oshawa, Ont. A clash of classes: The other side of Oshawa, Ont. The woodland campsite commonly known as ‘Tarp Mansion’ is one of the refuges for homeless people in Oshawa, a booming bedroom community where many are being left behind by economic inequality. Oshawa Creek wends its way through the heart of this Toronto-area city to empty into Lake Ontario. In earlier times, tanneries and other polluting industries lined its banks. Today, salmon and trout swim up the rushing stream in spawning season and cyclists enjoy a well-tended bike path. The creek’s revival is one sign of a robust urban comeback that is transforming Oshawa from a struggling postindustrial city to a growing bedroom community and employment hub. But a closer look at the creek reveals another side of Oshawa. 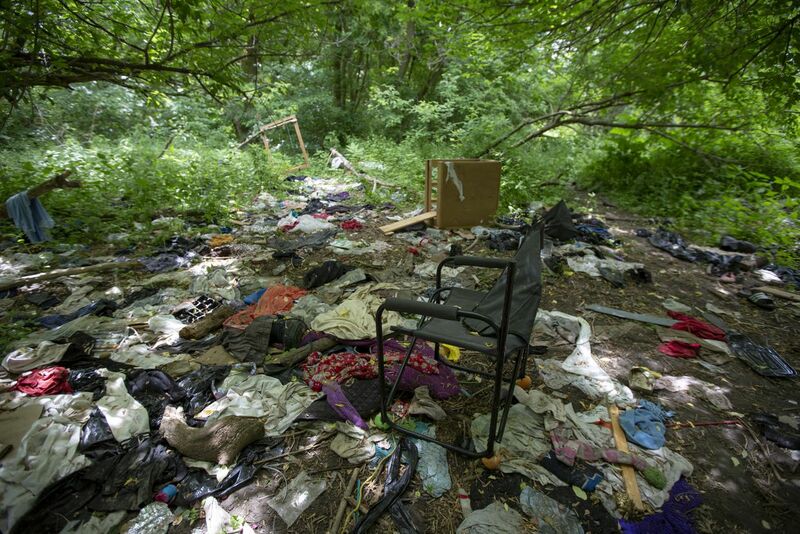 In a wooded area along its banks nicknamed Tarp Mansion, homeless people camp out in a network of garbage-strewn encampments, hiking up to the city in daytime to eat at soup kitchens and visit drug-treatment clinics. In one secluded spot known as the wintering shelter, they string tarpaulins from a bower of tree branches in even the coldest weather. In another, called the party room, the ground is strewn with used medical syringes and tourniquets left by drug users. One Tarp Mansion regular, Gary John Walton, 59, makes his way around in an electric wheelchair. He fell from a ladder and wrecked his leg more than 10 years ago. Known as Pops to his friends, he sleeps under the stars − no tent, no tarp. Calling out “knock, knock,” anti-poverty activist Christeen Thornton approaches to drop off a package at a nearby tent. She makes weekly check-in visits to the campers, leaving water, granola bars, hygiene products. “We have a huge disparity growing in terms of the difference between low-income people and high-income people, and this is only going to get worse,” she says, casting a look around the squalid campsite. The tension between Oshawa’s two sides − tidy and ragged, prosperous and poor − is increasing. Once a thriving automaking hub, the city at the eastern edge of Greater Toronto is trying to recover from a car-industry slump and rebrand itself as a livable community with a reviving economy and room to grow. Its slogan is “Prepare to be amazed.” But as new subdivisions spread and colleges build modern new campuses, the pockets of stubborn poverty stand out all the more. A series of events over the past year − a rooming-house fire that killed a mother and her two children, the murder of a teenaged girl whose torso was discovered in the harbour − have underlined the city’s struggles. Some downtown eateries have put safe needle-disposal bins in their washrooms. Banks close access to their cash-machines at night to prevent homeless people from sleeping there. When a downtown Tim Hortons shut its doors after becoming a hangout for drug users, locals took it as a bad sign. To find such problems in a Toronto exurb is unusual. Many of the city’s lowest-income areas sit on its northwest and northeast shoulders − what are called its inner suburbs. The outer suburbs and exurbs tend to be more prosperous. On a colour-coded map, parts of Oshawa stand out in red like an angry rash amid a swath of higher income blue. But then, Oshawa is not like the Toronto edge cities of Mississauga or Brampton that sprang seemingly overnight from farmers’ fields. It became a town in 1879, a city in 1924. Its big break came when Robert McLaughlin moved his carriage works to the city. The McLaughlins started building cars and the foundation was laid for General Motors of Canada. “Canada’s Motor City” became an industrial dynamo with bright hopes. “Oshawa today is on the threshold of greater things,” predicted a history of the city published in 1967. Hard times came when the auto and associated industries began declining around the turn of the century. GM now employs about 3,000 people, down from 23,000 in the 1980s. In the city’s gritty downtown, the median after-tax household income is just $32,500, lowest in Durham, the provincial region that has Oshawa at its heart. The downtown unemployment rate of 15.5 per cent is nearly twice the regional average. Forty-two per cent of children under the age of 6 live in low-income households. In the south Oshawa district of Lakeview, below the 401 highway that links the city to Toronto, families headed by single moms make up a quarter of the total. The proportion of young mothers − those under 24 − is 33.5 per cent, compared with 11 per cent for the region. The rate of Hepatitis C infection, often related to the use of intravenous drugs, is much higher in Lakeview. So is the smoking rate. So is the rate of domestic incidents where police were called. One young woman from south Oshawa says that, growing up, she wouldn’t tell people where she lived. “You have to apologize for being from there because of the way you will be judged,” says Amanda Robinson, a local historian and university teacher. Oshawa still has a reputation for rough streets and shady goings-on, a rap reflected in its much-disliked nickname: the dirty Shwa. Unlike some of the poverty in the immigrant landing pads in Toronto inner suburbs, Oshawa’s is mainly white. Just 7.4 per cent of residents in Lakeview are visible minorities. You don’t have to go down to the creek to find evidence of the city’s struggles. Along with stately old churches, a handsome library and an art gallery with works by Andy Warhol and David Hockney, the downtown has several shelters, soup kitchens and methadone clinics. Feb. 12: People line up in the cold outside the St. Vincent Pallotti’s Kitchen in Oshawa. Some of the 28 beds available at the Shelter Program on Simcoe Street, a 24 hour emergency shelter to men aged 16 years and above who are currently homeless. Cornerstone men’s shelter director Robert Brglez says the supply of low-rent apartments is shrinking as house prices rise and the fire department closes some rooming houses for safety violations. He says the shelter has been 90 per cent full on average this year. Trista Dove, 33, and Shawn Martin, 40. Oshawa’s leaders say the city is facing the same challenges as any urban centre. Mr. Henry, mayor since 2010, is keen to show how much his city of 166,000 has changed. Wearing the city crest on his sports jacket and driving a car that says “Oshawa proud” on the hood, he takes a visitor to see the university wind tunnel that can generate winds of 280 kilometres an hour and the hospital simulation lab where students can work on high-tech mannequins that groan, bleed and even give birth. Keep driving and you pass the growing campus of the University of Ontario Institute of Technology and Durham College. At the city’s northern border, near the expanding 407 toll highway, townhouse and apartment blocks are rising to house people priced out of the Toronto market. Planned new stations for GO Transit, the regional transit network, should make Oshawa still more attractive as a commuter suburb. New homes being built in a development in North Oshawa. The historic downtown is enjoying a modest renaissance. Two new hotels have opened. One of the roughest streets, Celina, now boasts a board-game cafe, Brew Wizards, where patrons can sip Romeo is Bleeding stout while playing Days of Steam. Oshawa likes to think of itself as a caring place, too. Every Sunday, a group of locals gather to hand out sandwiches and water to the needy in the city’s Memorial Park. Mr. Henry says Oshawa has a host of groups that work with the disadvantaged, from a big addiction centre that helps clients withdraw from drugs and alcohol to a settlement house that hands backpacks full of school supplies to poor children. An agency that assists the unemployed in finding work keeps 150 suits in the basement so that clients can look presentable when they go for interviews. One reason Oshawa draws so many needy people, the mayor says, is that the services they need are there. Oshawa has the only urban downtown in Durham, another draw. Christeen Thornton, the anti-poverty activist, says the city spent millions on upgrades to its airport but can’t seem to find the money for affordable housing. “You know, asphalt needs money thrown at it,” she says sarcastically. She accuses the city of taking a “not-our-problem” approach to the tent city by Oshawa creek. Yet it’s there, hidden in the bush, just steps from the streets of the comeback city. As Ms. Thornton walks through the “rooms” of Tarp Mansion, a happy murmur drifts in from across the creek. It’s the sound of children playing in a nearby schoolyard.